Hi, and welcome to JT Hughes Hyundai here in Shrewsbury. My name's Rob. Just going to take you around this used Hyundai i20. This is the 1.2 petrol Active model, on a 64-plate, done just over 35,000 miles, in white, 5-door. So it comes very well-equipped. You've got your alloy wheels, body-coloured mirrors and door handles. Around the back, this car has parking sensors fitted. As you can see, good-size boot, 60/40 split rear seats for any larger items, parcel shelf there to keep everything nicely out of sight, and courtesy light up in the corner there. We'll move into the rear passenger compartment. As you can see, it's very roomy indeed, good leg and headroom in the back here, three full seatbelts and we have ISOFIX fittings on the two outer seats in the back, together with electric windows. 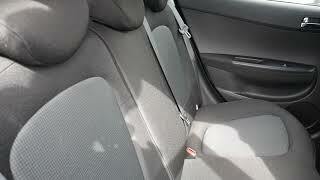 And if we move into the front, again, the front seats, nicely shaped and supportive. Nice cloth upholstery throughout, height-adjustable driver's seat. You've got your centre console here with plenty of storage, a couple of cupholders, 5-speed manual gearbox. You've got your USB, auxiliary input, and a power socket there, air conditioning. You've got your CD radio. You've got your information panel in the centre of the dash there to show you what radio station you're listening to or give all your trip computer information. On and around your steering wheel, we've got your audio controls. We've got your Bluetooth for your phone, Traction Stability Control all standard on the car. And in the driver's armrest, you've got controls for all the electric windows and the electrically adjustable and retractable door mirrors. So there we have it, a really nice used example of a Hyundai i20 1.2 petrol Active 5-door. If you'd like any further information, then please contact JT Hughes Hyundai Shrewsbury on 01743 450888. The new Hyundai i20 Turbo Edition - How Jekyll and Hyde are you?